Press - Stanley Real Estate, Inc.
A drive on the Alaskan Way Viaduct along the waterfront reveals a buzz of activity at the 619 Western building near Pioneer Square. But it's what will happen after the viaduct is taken down in that will make the renovation really special. 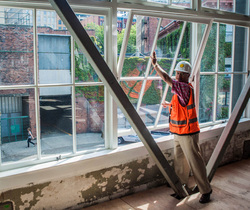 The former warehouse and renowned artist workspace, owned by L & B Property Investments LLC, is in prime position to take advantage of dramatic Elliott Bay and Olympic Mountain views when the viaduct comes down in early 2016. It's something potential tenants are already aware of. "We're noticing that there are firms that are anticipating (the viaduct demolition), and we're anticipating that as well," said broker Stanley Piha of Stanley Real Estate. "So from the standpoint of doing lease negotiations, we recognize that there is a transition period that they get in first. So they're going to end up dealing with that transition at the beginning, and they're entitled to the benefit after the viaduct."